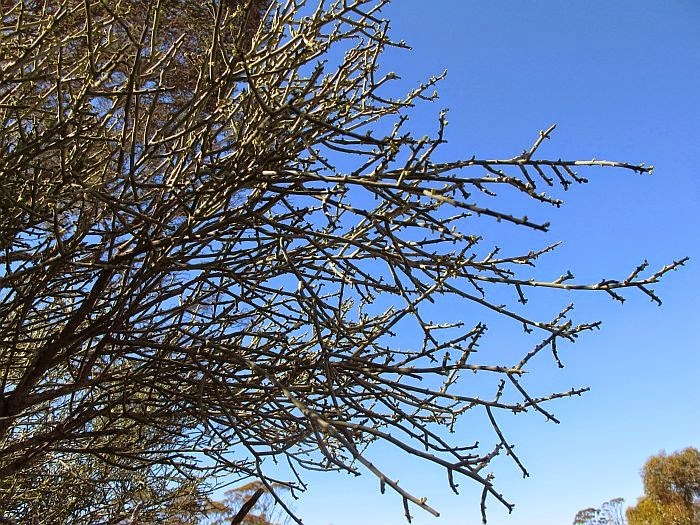 If you ever encounter a large, dense, leafless shrub, especially around saltlakes, which have stiff branches that you cannot easily brush past, then it could be the Leafless Ballart. It is recorded growing to 5 metres (16’) in height, although locally I have rarely seen it more than half that height. Apart from impeding your progress it does not stand out in the bush, as the flowers are very small and easily overlooked and the fruits, which although red are rarely in clusters and also tend to go unnoticed unless sought after. 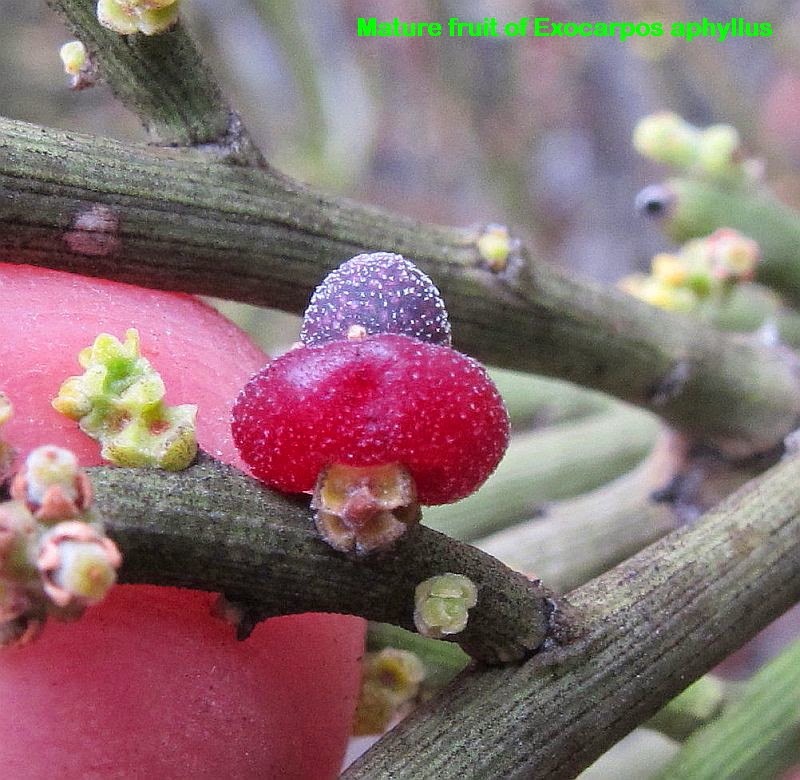 Like many other Ballarts the fruits are quite sweet and edible, however the tasty part is not from the developing seed, but is the expanded pedicel (flower stalk) developed after the formation of the seed portion that sits atop it. Aborigines regarded these little tasty treats as children’s food, being considered not worth the effort of collecting for general consumption. Birds on the other hand would be the main consumers and in the process of eating the red soft tasty fleshy part, will also swallow the seed, which passes through their gut, where the gastric acids will promote germination, plus in the process the bird will spread the seed further afield. 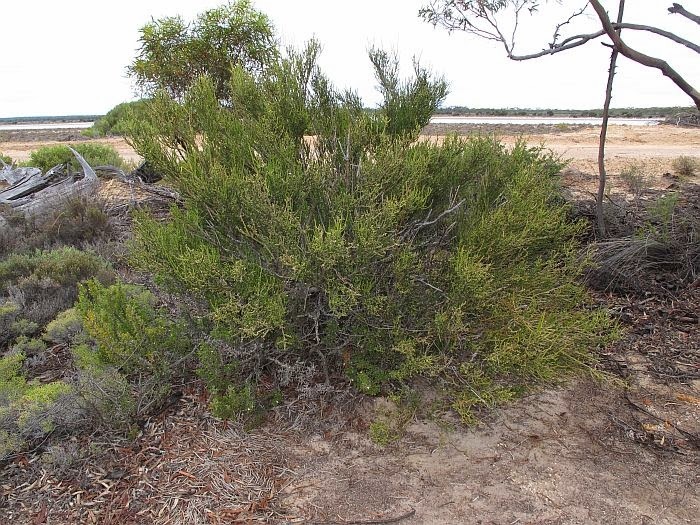 In WA the Leafless Ballart prefers the drier conditions of the inland and is common and widespread (growing as individuals or in small colonies) south of a line from Exmouth (via Wiluna) to the southern WA/SA boarder, but excluding the wetter SW corner of the State. Is also common in the southern portion of SA, the north of Victoria, then west of the Great Divide through NSW and southern Qld. This species and other Ballarts are partial root parasites, whereby their roots attach themselves to the roots of other plants to pilfer their sap, which then in part, will supply them with nutrients. 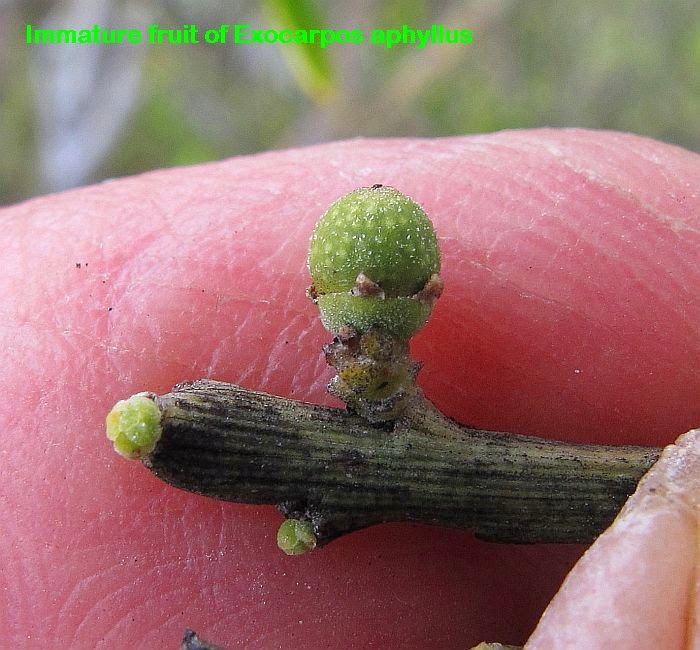 Such relationships are seldom fatal to the parasitised partner and usually both prosper, but it does mean Exocarpos aphyllus is commonly found under eucalypts and/or with other shrubs. 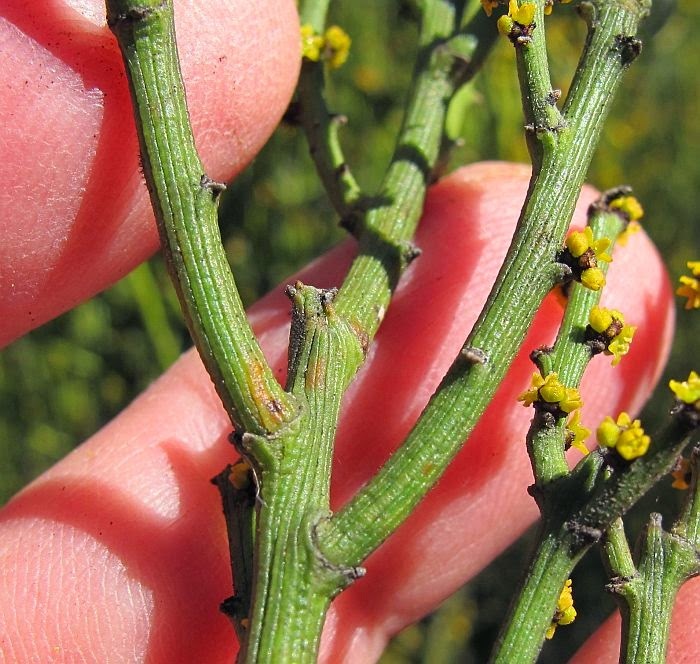 When not in flower or fruit, Exocarpos aphyllus may be confused with other closely related root parasitic plants, in the Choretrum or Leptomeria genera, but these tend to have smooth flexible branches, whereas Exocarpos aphyllus develops stiff, thick branches that are noticeably deeply grooved. 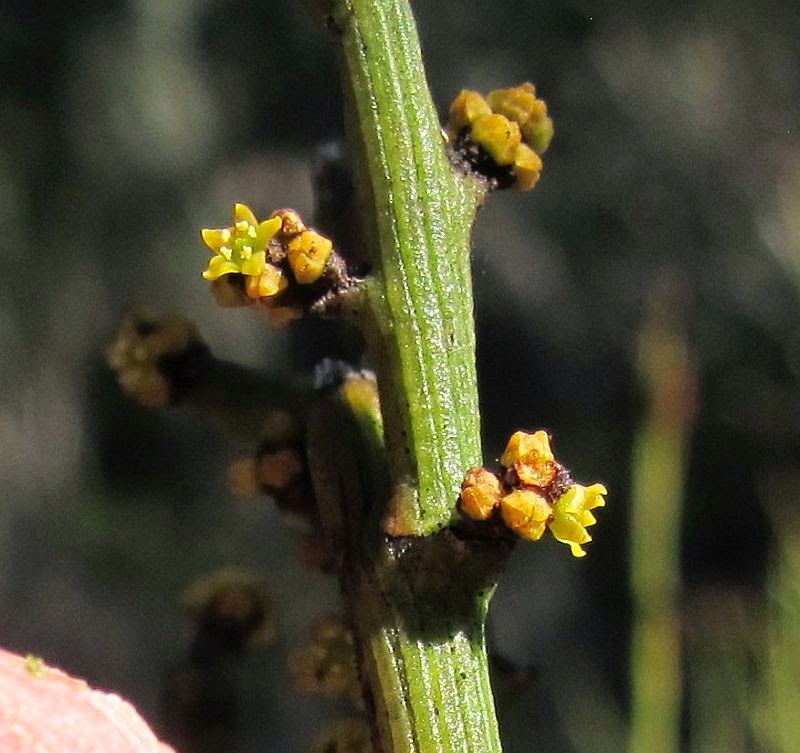 In SA and Victoria, the fruits are required to distinguish it from Exocarpus syrticola, however that species is coastal and unlikely to be found in the drier inland where Exocarpos aphyllus is usually found, although in parts of SA, both may be encountered in some coastal districts. Except for mid-summer and mid-winter, flowering can occur anytime, so fruits are also often available. Exocarpos is part of the Santalaceae (Sandalwood) Family.